One thing to remember about digital transformation is the fact it’s a constantly moving target. This perhaps most apparent in the retail world, where digital transformation used to mean adding a basic ecommerce storefront to your previously dumb website… but today it could mean omnichannel customer services and chatbots. Or personalized offers based on your shopping history. Or ordering a pizza by shouting “Feed me!” at Alexa. The world of brick-and-mortar retail is currently going through wave after wave of digital transformation, affecting everything from the store front to the warehouse. This is a global trend, in fact, over half of the world’s online retail transactions are now taking place through online marketplaces like Alibaba and Amazon. It has hit brick-and-mortar high street hard, with closures of once great brands becoming an annual occurrence around the world. There are many factors influencing this, but clearly the rapid growth of online shopping has made traditional retail growth and revenue strategies – fixing price models with producers and wholesalers (recommended retail pricing or RRP), sales promotions, and conventional marketing strategies – ineffective. The old world of conventional retail wisdom has found it hard to adapt to the online playbook, with its sheer abundance of online deals, offers, auctions, third party resellers, bundles, recommend to a friend, social media review sites, paid searches, native advertising, new discount subscription models and delivery options that are just a app, a click or a swipe away, 24/7. The world of brick-and-mortar retail is currently going through wave after wave of digital transformation, affecting everything from the store front to the warehouse. Frictionless is a useful word for the industry, but it sounds like jargon too, so here’s a better way to put it: No queues. Stores where you can walk in, take what you want, then simply walk out again are on the way. 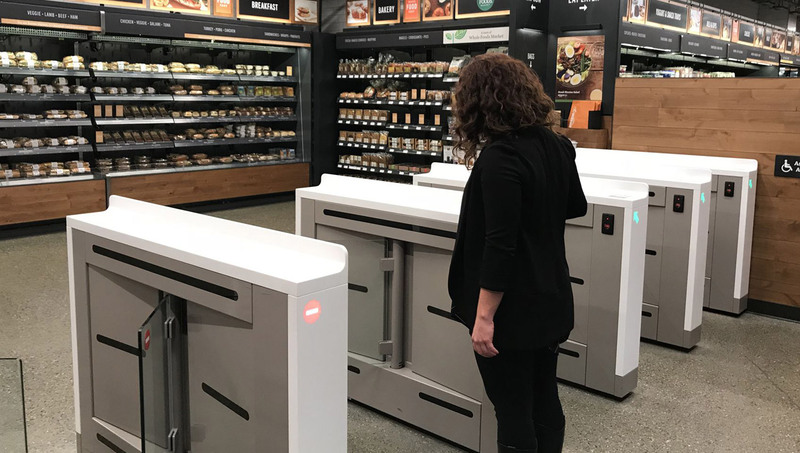 Amazon Go is testing this model already in flagship Whole Foods Market stores. It’s an example of a particular aspect of digital transformation called ‘blending’ – where you blend digital tech with physical customer experiences. In this case, the no queue store experience uses an app on your phone to check you into the store. Sensors then track the items you remove from the shelves. When you leave the store, it adds-up your bill, charges and sends you a receipt. The reason this is a big deal isn’t just about avoiding the queues, it’s about extending store opening hours to wrap around people’s schedules, rather than people wrapping their schedules around the store. That’s also important for employees, because nobody wants to man a checkout at 2am in an empty store. So staff can work more sociable hours, and rather than merely operate checkouts, they can focus on helping customers in-store with more complex services, so it’s a better use of their time, and a better in-store experience for the customer. Win:Win. Yes, more blending. This idea is being trialed by Chinese giant JD.com, and also Amazon’s new Wardrobe service. In both cases, the idea is to make it easier to engage with physical products through digital channels, which is something that’s always been complex with products delivered to your home. Amazon’s own data suggests around a third of customers want to touch items before they buy (and even more so with food shopping) so the blended model is a response to a clear customer need. The idea of blended sales is simple: use digital for what it does best, browsing and researching products, so no change there. Then the blending comes in, let’s say you select five tops to try on, you select them and get them delivered to a nearby clothing store, or have them delivered to your home. The items come with pre-prepared return packing, so you can quite literally try, buy or return in one simple step. This idea shows how important customer journey mapping is, because most people order clothes from an online retailer, knowing full well some of them will end-up being returned, but there’s no easy way to try things on. Again, it’s a friction point in the digital customer journey. Blending like this is really good news for brick-and-mortar retail stores, because by partnering with try-buy digital models (like Amazon or JD.com) they drive footfall in-store, much like click-and-collect drop points. Most click-and-collect points report an upswing in sales, due to the fact visitors buy additional items when they come to collect. Blended sales models do the same. So for the business that’s enabling the try-buy service, they deliver a more useful customer experience. For the brick-and-mortar store with the customer fitting rooms and accessories, it’s more traffic and more sales. Win:Win, again. You might have already experienced this digital transformation, it’s a way of engaging customers more effectively through variable pricing. At this point, it’s important to know that retailers and brands used to fix prices – with mechanisms like the Manufacturer’s Suggested Retail Price (MSRP) or Recommended Retail Price (RRP) and similar. This would often include schemes where the brand supplied point of sales marketing or advertising collateral in return for higher wholesale or retail prices. However, in the world of online marketplaces, which are accessible by third-party resellers, wholesalers, and all kinds of non-traditional retailers, price controls like that simply don’t work. This means surplus stock can sell at vastly discounted rates, and at times of high demand (like Christmas) certain items like must-have smash hit toys can sell for multiples of the MSRP. Digital technologies however, can also help retailers use prices again as customer loyalty and engagement tools, not in a race to the bottom price war, but by initiatives like Walmart’s cheaper-in-store model (where items are offered cheaper if the customer collects rather than opts for free delivery and pays the MSRP). Similarly, US retailer Nordstrom uses systems to ensure in-store items are always price matched against their online discounts at the checkout, meaning if they do a sales promotion for an item online, the same deal applies in-store, even if the items in-store are marked-up at the old MSRP price. In both examples, this uses more blending techniques; for Walmart, they reduce their shipping overheads and build customer loyalty by offering preferential pricing to customers who come in-store; for Nordstrom customers, their customer loyalty is strengthened by ensuring their shoppers always get the best price on offer. In both cases, there’s a boost for in-store footfall – which increases ad hoc sales, and smarter use of their online presence to drive sales using price promotions. It’s the digital transformation of the traditional sale, from a short-term price promotion to increase sales volumes, to constantly variable pricing to increase the lifetime revenues per customer. Shopping represents a complex customer journey, and the digital world has transformed it in many ways. The high street shop once looked like an endangered species. Look back over the last decade, as online shopping really began to boom, and it’s easy to see why. People love browsing and shopping for certain kinds of items, but nobody likes traffic congestion, parking, or queues, or returning items to stores (with more congestion, parking and queues) or finding items out of stock after they’ve been through all that. Shopping represents a complex customer journey, and the digital world has transformed it in many ways. We’ve seen a boom in home deliveries, premium services like Amazon Prime, and 2017’s fastest growing supermarket was the digital-first brand Ocado, despite the success of cheaper discounter brands like Aldi against the brick-and-mortar giants like Tesco, Asda and Sainsbury’s. However, brick-and-mortar retail is bouncing back, as digital technologies enable smarter real-world customer journeys. And no matter how tough things get on the high street, there are some things that are only frictionless in-store, like trying-on five new outfits but buying one; feeling your fruit and veg to gauge the ripeness of the items you buy; or just getting a feel for the weight and texture of an item before you buy it. Humans are hands-on, sensual creatures, and the one thing you can’t do with a computer, is put your hand inside it to feel what’s on the screen. In Part 2: A tale of two concepts, we’ll look beyond digitally blended sales, customer service and operational processes and consider the way digital transformation has created new shopping concepts that are changing the way we think about shops and the communities that coexist around them. Jennifer is a talented user experience researcher, with over 7 years in the UX industry, working with major brands across the broadcast, telecoms, finance and retail sectors. With a degree in Social and Cultural Studies and an MSc in Human Computer Interaction, one particular area of expertise is consumer purchasing behavior, particularly in relation to loyalty. Jennifer is a marathon runner, and has her sights set on the Midnight Sun Marathon in Norway.